A Perfect Family Circle, LLC (APFC) was created for one simple reason. The APFC family is happiest when we are helping others remain healthy, independent and secure. For us there’s no better feeling than helping someone live in their own home—wherever that might be—for as long, as confidently and as comfortably as possible. The genuine act of helping someone who really needs help, not because they don’t want to do it for themselves, but rather that they can’t do it for themselves, is a gift not only to the person receiving the help but also to the person giving the help. There’s mutual gratification. We believe this with all of our hearts and every caregiver we employ shares our passion and believes we all need to have a sense of duty and an ethic in caring. Serving others is what we do and we do it with everything we’ve got! APFC Home Care is a team of individuals devoted to providing our customers with the most comprehensive care possible. We offer free in-home assessments designed to discover the best possible plan of care that ensures security and peace of mind for our customers. APFC Home Care is not a staffing agency or simply a referral service. We offer on-call home health and personel care better than anyone because we consider our customers to be part of our family. What Sets APFC Home Care Apart? We are a family owned and operated business that is laser focused on the wellbeing of our customers. All of our mature Caregivers are fully screened, bonded and insured. We offer highly individualized care based on the unique needs of each family member requiring attention. We provide a free, initial in-home assessment. We’re there when you need us fast offering a 24 x 7 x 365 support system with quick turn around times. Our customers are educated on all of their options with accurate and in-depth information. APFC is dedicated to making sure that our customers live a healthy, happy & independent existence in the safety of their own homes. We work with family members to develop a comprehensive assessment that allows us to cater our care plan and services to effectively meet our customer’s unique needs. Our nurses will also conduct a preliminary medical and health history to understand specific living challenges which helps them prepare our caregivers to deliver thoughtful, individualized care from the very beginning. A caregiver can prepare meals, complete light house-keeping (“Honey Do List”) and offer friendly companionship. APFC caregivers have successfully completed our extensive training program that was specifically designed for in-home caregivers and many have various special skills and attributes that are extremely beneficial to those in need. We specialize in short and long term elderly care for your loved one with scheduled-in-advance or just-in-time services. Our caregivers are responsible, caring and flexible individuals with experience in household management for non-medical, in-home support services. They work with our on-staff RNs and case managers to provide the most complete care in the industry. Learn how we can start helping you today! With a growing number of older adults living independently, it’s increasingly important to ensure that they’re safe at home. During the initial assessment of your home, APFC can recommend (if needed) and perform modifications to the home that will make it safer for your loved one(s). Potential improvements include but are not limited to grab rails, tub/shower conversions and access ramps. Our mission is to identify and promote successful strategies that accelerate the adoption of technologies that improve the ability of older adults to remain in the community. We work with several providers to offers consumer friendly technology that assures families that their loved one is safe, while also gathering powerful behavioral data to support providers in delivering the best care possible. A Perfect Family Circle, LLC is Open for Business! Is your imagination ahead of the whole home health care industry and you're sick of waiting for them to catch up? Here's your chance to go over their heads and deal with someone who actually cares about what you want. Click a question to expand and get the answer. How is APFC Home Care unique? APFC’s commitment to “family-first” and an effortless customer experience is our biggest strength. We treat our customers like family – Let’s face it, the things we do for our customers like bathing, dressing, feeding and transferring if not by us would most often be provided by actual family members . For them, knowing that we truly care for their loved one’s well-being can’t be understated. Customers requiring care will be matched with a primary and secondary caregiver. However, we ensure that every customer will meet every caregiver in their bubble at least once during scheduled appointments. This ensures that no customer will receive services from an APFC caregiver prior to them being introduced. We call them family “drop-bys” just to say “hi” and see how you’re doing. APFC Home Care offers people recovering from an illness or needing assistance with the personalized attention they need in the comfort of their own homes, allowing them to retain their dignity and independence. Many times, home care prevents or postpones the need for a hospital stay or nursing home care. Living at home is often the best option for those recovering from an illness or hospital stay. Home care offers one-on-one attention to your health needs. In addition, home care creates companionship, company and conversation in a comfortable and private environment. 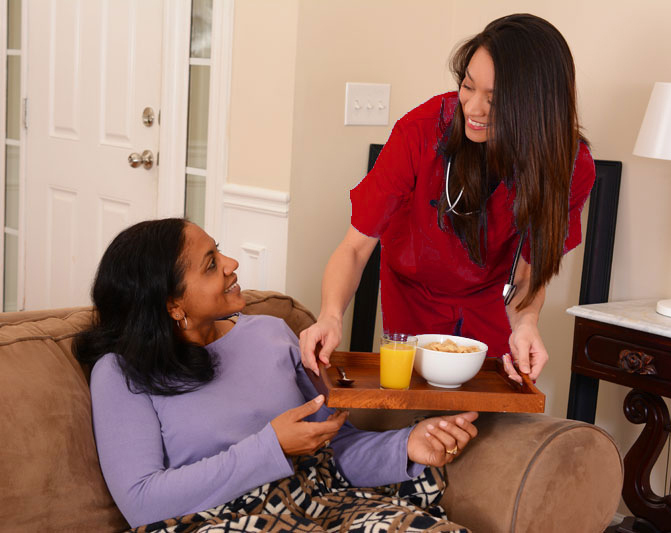 What’s the difference between Home Health Care (Medical) and Private Duty Care (Non-Medical)? Home Health Care (Medical) is medically driven and helps adults and seniors who are recovering after a hospital or facility stay, or need additional support to remain safely at home and avoid unnecessary hospitalization. These Medicare-certified services may include short-term nursing, rehabilitative, therapeutic, and assistive home health care. This care is provided by registered nurses, physical therapists, occupational therapists, home health aides and medical social workers. 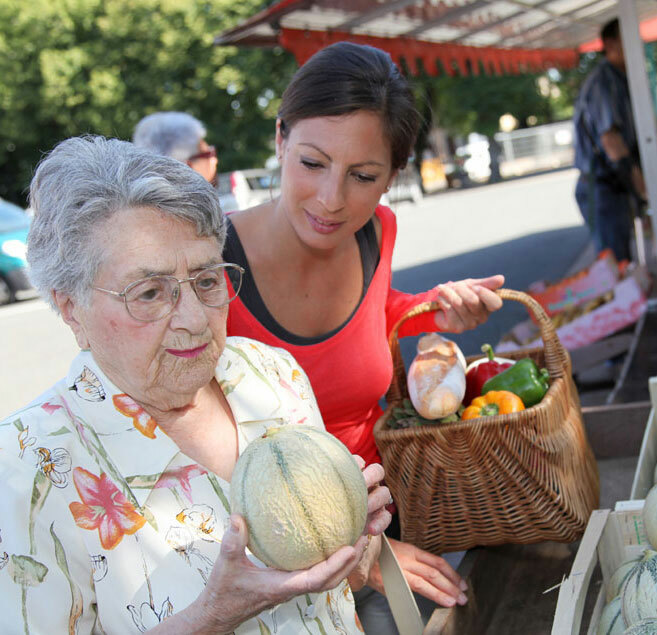 Private Duty Care (Non-Medical) offers a broad range of long-term services to assist senior adults with their daily lives, from non-invasive medical and nursing care to transportation services, meal preparation and companionship. The goal of a private duty caregiver is to provide whatever support a senior adult needs to remain independent as long as possible in their own home. These services are not Medicare-certified and therefore must be paid for by either LTC insurance or private pay. APFC is a Private-Duty Care provider that is not certified by Medicare. What’s the difference between skilled and non-skilled home care? APFC Home Care provides what is considered by the health care industry as non-skilled home care. However, we have a staff of Registered Nurses that perform all initial patient assessments and develop individualized care plans for our caregivers to implement. A health service is determined to be skilled based upon whether or not clinical training is necessary for the service to be delivered safely and effectively and on the need for physician-directed medical care. Examples of individuals with clinical training include a registered nurse, licensed practical nurse, respiratory therapist, physical therapist, occupational therapist, and speech therapist. This list is not all-inclusive. Do not seek to cure or which are provided during periods when the medical condition of the patient is not changing or are non-health related services for activities of daily living (ADLs). Examples of such services that assist with ADLs include bathing, dressing, toileting, transfer, continence and feeding. How are home care and hospice different? Home health care is typically short term. A nurse will develop a care plan with set goals. The Caregiver will work with the patient to meet those goals and once achieved the patient is discharged. On the other hand, Hospice is focused on end-of-life care. Hospice workers are most concerned with maintaining quality-of-life for the patient. It’s all about keeping the patient comfortable in their own home while managing a terminal illness. It varies on a case-by-case basis depending on the individual’s unique needs. Caregivers can be dedicated live-ins, offer 12x2 support 7 days a week, or just come a few times per week for a couple of hours. Again, every patient’s care plan is personalized. What's the difference between a live-in Caregiver and 12x2 care coverage? When it comes to needing care 24/7, it's important to define what level of care you need. Does the patient need monitoring all day and all night or only when he/she is awake? If the patient truly needs the aide to be awake every hour of the day, we would assign two aides to each 24-hour period which is consider 12x2 care coverage. We would assign 4 aides to cover a full week. On the other hand, if the patient only needs an aide while awake, a live-in Caregiver can be hired to reside in the patient's home and be available whenever needed. The Caregiver is provided with their own bedroom either permanently or for extended periods of time. A live-in aide will be able to get some hours of uninterrupted sleep and a couple of "off duty" hours a day. We usually suggest 2 live-in aides to cover the seven days in a week. Home Health Care and Hospice are covered by commercial private insurance and Medicare/Medicaid. Personal Care (Private Duty or Non-Medical Home Care) is covered only by long-term care insurance or through private pay. How is one evaluated for home care? Home Health Care that’s covered by commercial private insurance and Medicare/Medicaid typically requires the patient’s primary care physician to order Home Health services. There’s no need for a patient’s physician to order Personal Care (Private Duty or Non-Medical Home Care). Anyone interested can reach out directly to APFC Home Care. What's the difference between Activities of Daily Living (ADL) and Instrumental Activities of Daily Living (IADL)? ADL care is limited to assistance with activities such as dressing, grooming, feeding, bathing, toileting and transferring. On the other hand, IADL care are associated with tasks that enable a person to live independently at home such as meal preparation, driving, light housework, managing finances, assistance with the physical taking of medications, and arranging medical care. If you are covered by Long Term Care Insurance, an APFC Home Care representative will be your advocate for your needs and work directly with the insurance company. No, APFC is considered a private-duty home health care agency. We accept most LTC insurance providers and private pay. What won't Medicare cover as part of a member's Home Health Benefit? Homemaker services - Homemaker services include shopping, cleaning and laundry when this is the only care you need, and when these services aren't part of your plan of care. APFC Home Care is ready to provide all of these non-skilled services. If you do decide to use a Medicare-certified home health agency make sure they tell you how much Medicare will pay. The agency should also tell you if any items or services they give you aren't covered by Medicare, and how much you'll have to pay for them. This should be explained by both talking with you and in writing. The home health agency should give you a notice called the "Home Health Advance Beneficiary Notice" (HHABN) before giving you services and supplies that Medicare doesn't cover. How can we ensure that APFC Caregivers are on time and work the required number of hours if the patient is home alone and suffering from dementia? All of our Caregivers are carefully screened to make sure they're committed to providing ethical care. However, APFC uses an Electronic Visit Verification (EVV) system that monitors the arrival and departure of home care workers to and from the home of a recipient of services. Customers will receive an attendance report with their monthly invoice. Are all of your caregivers carefully screened? APFC Home Care conducts thorough background, criminal and reference checks on all of our employees. Our normal business hours are Monday-Friday from 8:30AM to 5:00PM. However, AFPC is on-call and available to provide services 24 hours a day every day of the year. APFC offers a minimum of 2 hours of care per visit to 24 hour care (live-in or 12x2). Restrictions may apply. Please Contact Us for more information. Do I need a physician’s authorization for services? No, an authorization is not required for our services. However, we will work closely with your physician and family caregivers to ensure that we are creating the most comprehensive plan to meet your specific needs. Does APFC serve the entire community? APFC welcomes anyone within our family bubble which is a 13-mile radius around the APFC Home Base in Medford. Burlington, Chatsworth, Delran, Eastampton, Evesham, Hainesport, Lumberton, Maple Shade, Marlton, Mount Holly, Mount Laurel, Medford, Medford Lakes, Moorestown-Lenola, Pemberton, Shamong, Southampton, Tabernacle, Westampton, Willingboro and Woodland. If you need immediate assistance please call +1.855.523.APFC | 24 hours a day, 7 days a week. This form should not be used for emergency medical care. A member of our staff will respond to you Monday - Friday: 8:30am - 5pm. Like to learn more about home care & the APFC advantage? A Perfect Family Circle 2019. All Rights Reserved. Responsive website designed by MilesTechnologies.com.